You know how everybody sobs uncontrollably during the first 15 minutes of the movie "Up" or the ending of "Titanic"? Well, that also happens to me when I watch the opening scene of "Midnight in Paris". My name is Courtney, and I am a Francophile. Although I last visited Paris in September 2013, I fear that one year is just too long to stay away. With my face plastered to the airplane window and my eyes tearing up from joy, I realized that my soul desperately needs another trip to Paris. Stat. Back in 2010 when I was studying abroad in the south of Spain, I took a spontaneous trip to Paris over Easter because I knew I would be a fool to fly all the way to Europe and not visit the city I had been fantasizing about since I was a little girl. Visiting France had been a dream and obsession of mine since I could remember; even my bedroom was decorated with a Parisian theme. Needless to say, the minute I set foot on the cobblestone streets of the Left Bank I fell head over heels in love. My infatuation with Paris intensified when I lived there during the summer of 2011. Technically I was there to study Surrealist art and literature, but really I was there to bask in the magic of the city. While I learned my fair share about André Breton and his crew of offbeat surrealists, I spent most of my time eating macarons from Ladurée, frolicking through the Luxembourg Gardens, practicing my broken French in charming cafés, and wandering aimlessly through my favorite museums. When I visited Paris last September for the third time, I wasn't too keen on spending my time powering through endless hours of sightseeing. Rather, I spent my days leisurely exploring, strolling through the rainy streets, snacking on macarons in the Tuileries, and channeling my inner Hemingway at sidewalk cafés. When I needed a change of pace from sipping wine at Les Deux Magots and indulging on delicious (but seriously overpriced) hot chocolate from Angelina's, I let myself get lost in a sea of impressionism at the Musée de l'Orangerie and the Musée d'Orsay for hours on end. As cliché as it may sound, sometimes I feel like my soul belongs in Paris. (So naturally, I live in Madrid...?) But being in Paris feels so right, as if the entire universe aligns as soon as I arrive. No other city has made me feel so effortlessly fulfilled by the surrounding art, culture and beauty. The joie de vivre is contagious there - and oh, how I miss it. 49 comments on "Paris Gives Me Heart Sparkles"
I know what you mean: to have a city where you feel like you TRULY belong but for some reason... you aren't there! Paris is truly magical, indeed. I love when you get to know the city and the sights enough that you barely even bother with them when you go, like your last trip to Paris. Two years ago I spent 2 weeks there just wandering and strolling around, eating macarons & sitting at cafes... this is what Paris is about! Loved this! I just recently visited Paris for the first time and it was amazing. I had dreamed of visiting the city since I was a kid too, and it didn't disappoint! I'd love to go back and spend less time sightseeing and more time wandering and sitting in cafés! I'm heading to Paris for the first time in a couple of weeks and I'm so torn on how to spend my time!! I want to see everything but I also just want to soak it all in!! Still frantically tweaking the itinerary!! I know precisely what you mean... Paris gets me, and that's all there is to it! I can barely look at this! Ugh I <3 Paris so much and your photos make it look even more beautiful! First of all, my post is about Istanbul! You're going to love it!! So like, when are we going???? Exactly! There's just something about it that emanates magic. Hahah thanks :) hopefully you got to spend a little more time there than I was able! I liked Paris, but my husband looooooved it and wants to go back! I like the idea of doing what you did more than sightseeing, so maybe that's where "my" Paris lies. When I was in Paris I stayed in a dumpy hostel and mostly ate at crappy tourist trap restaurants...and I know I missed out on a lot. I can't wait to go back again and give Paris a second chance! Oh no! I hope you get a chance to go again soon - I definitely would not have loved it under those circumstances! The sightseeing can get overwhelming pretty fast - I'm a firm believer that Paris is meant to be savored at a slower pace! How exciting! The first visit is always the most magical :) For a first timer, I recommend spending just as much time sightseeing as leisurely exploring. All of the museums and monuments are spectacular, but you'll enjoy Paris more if you allow yourself lots of time to wander and get lost!! It's the best way to get to know the soul of the city, and it's really difficult to fit all of the sights into one trip anyways! 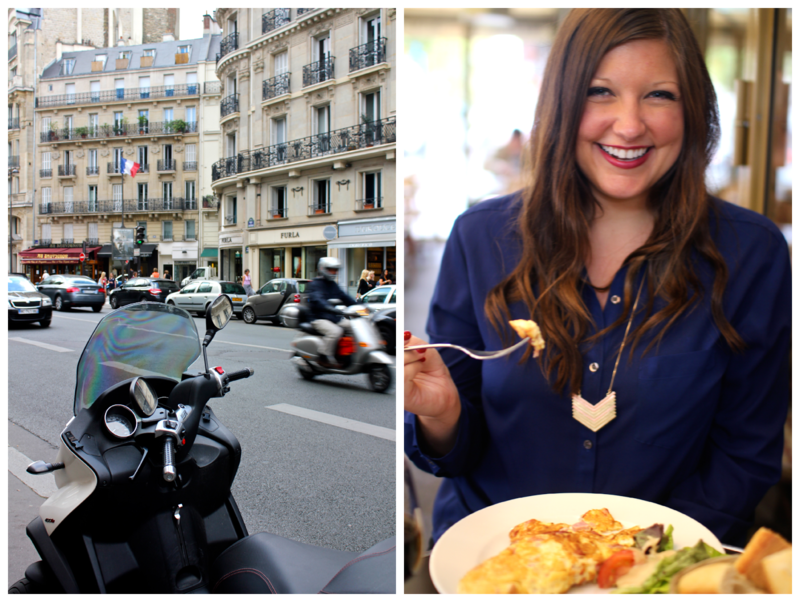 Agreed - I'm a firm believer that this is the best way to enjoy Paris! Although I do hit up the Eiffel Tower and my favorite museums when I'm there as well :) For such a big city and bustling European capital, it always amazes me how "livable" Paris feels! If I didn't love working in Madrid so much (and if I were actually proficient in French), I'd move there in a heartbeat. I still haven't made it to Paris and it has never been on the top of my list, but visiting in your style with many macaroons, French cafes and a lot of aimless wandering make it sound much more enchanting! Paris looks so lovely, and your pictures are beautiful! I can't wait to visit in the future!!!!! It definitely makes the city more magical than just rushing from sight to sight! I think too many people try to squeeze in as much of Paris as possible on their trip, and don't leave enough time to get lost and soak in the beauty. Thanks Betty! I'm super excited to co-host it these next few months! I'm glad you've found a place like this which means so much to you. I also have a place which I believe is the home of my heart--it's pure joy to get to be there! Oh man ... you made me miss Paris and fall in love with it all over again! I love just wondering around in a city. Your pictures are so pretty! Man, I need to make another trip to Paris! There's nothing more satisfying than getting to spend time in "that" sort of place :) I think it's so special to be able to connect with a city that deeply! Thank you!! I hope you can make it there again soon :) There is always more wandering and exploring to be done in Paris! I know how you feel - I often feel that my heart belongs in Paris too. Love that city. I looooved Midnight In Paris. I haven't made it to Paris yet, but it's top of my travel list. Sadly I'm on a really tight budget that barely lets me breathe to pay rent, so it's going to be a while yet (unless I suddenly get a full-time job, and I don't have time to look, so...). I have to ask though, are you planning to move to Paris at any point? I could not agree more. I am such a Francophile, who splits time between the Boston area and Galicia, Spain. I hope that someday we can own, even a closet, somewhere in the City of Lights. We're headed there next week. SO can't wait. My heart is fluttering as I type. Cheers! Oh I hope I get to visit Paris some day!!! It does look like a charming place and the architecture is beautiful!! I completely agree. Joie de vivre is one of my favorite sayings, and truly encompasses Paris! 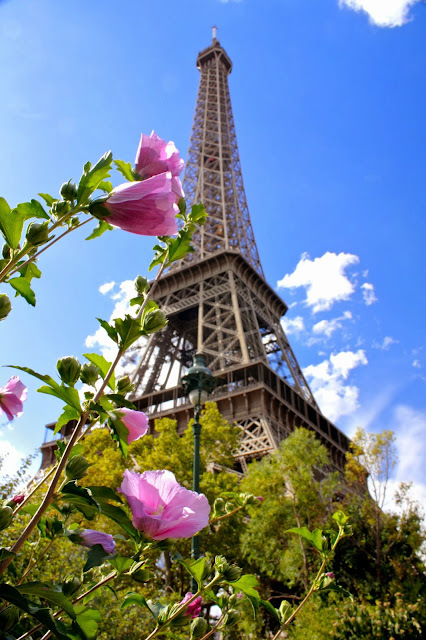 Paris is a magical place- loved reading about your love affair with the City of Light! I always wanted to see Paris if only just once. My hubby had no desire to go, but we compromised - I said we'll go just for 3 days (it was at the end of a trip to Italy) and I'll get it out of my system. Well, we both fell in love and ended up moving to Paris two years later! So cool that you made your dream move to England and are now pursuing photography! That's so awesome. I can't wait to read more about it on your blog! Hopefully you can make it to Paris eventually, considering it's such a short trip from London! Agreed! I would totally settle for a closet in Paris if it meant that I could live there cheaply! So jealous that you're going in just a week. Have an amazing trip! It's beauty can't be beat! I hope you get to visit someday too, it'll charm your socks off! It really does! The French are just so good at naturally embracing it! Thank you Autumn! I agree - it's only overrated when you go from tourist site to tourist site without taking any time to actually enjoy the city. I hate it when people do that and then tell me they had a horrible experience. If only everyone allowed themselves to experience the magic of Paris without an agenda!